Gasketed Plate Heat Exchangers | Heat Transfer System | CH Bull Co. Originally designed for the dairy industry, gasketed plate heat exchangers have become one of the most versatile and cost-effective heat transfer solutions available. Used in applications ranging from pharmaceutical processing to electronics manufacturing to power generation, these devices are designed for reliable, high-performance operation. C.H. Bull provides customized gasketed plate heat exchangers built to our customers’ specifications. These systems' early washboard-style designs of have evolved into herringbone- or chevron-patterned designs that improve heat transfer capabilities by increasing turbulence throughout the heat exchanger. That turbulence also makes these devices self-cleaning, and because they don’t plug or clog, they provide a constant, consistent pressure drop for improved performance. Their designs make any cleaning or maintenance that is required a relatively simple undertaking. Modern gasketed plate heat exchangers can also achieve very high pressure ratings using very thin plate material, thanks to the thousands of contact points on their plates. They can operate at pressure levels from near-full vacuum up to 500-plus psi. Based the needs of your application, C.H. 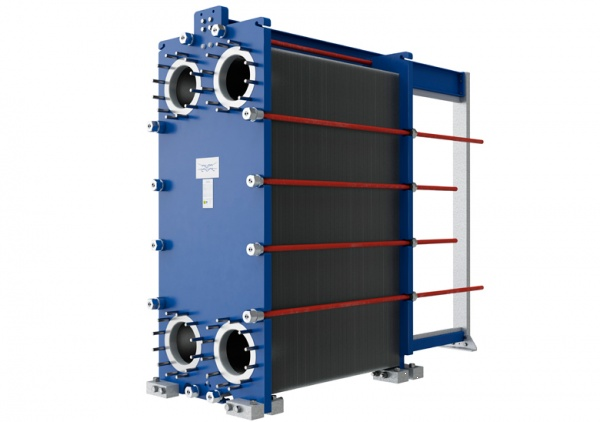 Bull can develop a gasketed plate heat exchanger that is specifically engineered to your requirements. We can provide systems small and large, with anywhere from 20 plates to 400 or more, as your heat transfer needs demand. We can provide a custom configuration, if needed, to fit the space you have available. We will also work with you to determine the best material for your needs—stainless steel, titanium, hastelloy, or any of a range standard and specialty metals and alloys. There have been many occasions where a customer needed a customized heat transfer solution for their gasketed plate heat exchanger. Here are a couple of examples of past customized gasketed plate heat exchanger projects that we have completed for our customers. A customer needed to regulate the temperature of an acid-water solution that would eat through stainless steel plates in just a few days, and hastelloy plates in less than a year. To combat this, we tracked down a special hastelloy alloy that lasts up to ten years in highly corrosive environments. We were able to work with these customers to figure out a customized heat transfer solution for their gasketed plate heat exchanger needs. No matter what your application, environment, or heat transfer needs, C.H. Bull can provide the perfect gasketed plate heat exchanger. Request a quote today or contact us for more information.